This year for our advent calendar we will be doing something really fun. Daddy will be away for half of December. We will need something to keep us busy. This will be our first Christmas in Okinawa. We are really missing our friends and family. We really miss our church back in California. I really want to make this Christmas special for the kids. Christmas is always a really exciting time of year for us. We have been collecting Christmas books and movies, adding more each year. The kids always love reading these books, watching the movies, doing fun Christmas crafts and making yummy treats. I decided to combine all our favorites into our 25 days of Christmas Countdown. Each day we will read a Christmas book, watch a Christmas movie, make a fun craft or do a fun Christmas activity, and eat a yummy treat. Some days everything will relate to each other, other times it might just be certain parts. I gathered our 25 Christmas books and wrapped them in brown shipping paper, wrapped crepe paper around them and added the day. I made 3 different tags for each day, 1 for the movie, 1 for the craft/activity, and the other for the treat. I wrote the info on the back. Each day all 4 kids will get to open a part. I love how the books turned out. I think they are really cute. The kids are really excited for our 25 Days of Christmas Countdown! love this idea! I've been gathering books all month to wrap up and do the same! This is so sweet i love it! I do something very similar with our children but we tend to do one thing. One day it will say watcxh a christmas film etc...yours sounds much more fun!! such a great idea. Really brings you together! 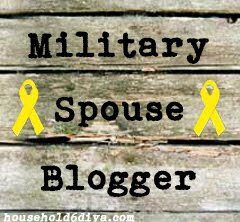 I thank you and your husband for your service to our country. My niece graduates from Marine boot camp this Friday! God Bless!